Ousted regime that vowed violent reprisals, finally follows through. February 2, 2015 (Tony Cartalucci - LD) - Two powerful bombs exploded in downtown Bangkok Sunday night, just days after ousted prime minster Yingluck Shinawatra was impeached from office amid threats from her political party that violence would follow. Former prime minister Yingluck Shinawatra's impeachment yesterday was hailed by her opponents as the dawn of a new era, but characterised by her supporters as a new chapter that would ignite political violence and deepen division. Prime Minister Prayut Chan-o-cha yesterday pledged to take legal action against people who threaten to use violence to protest against the government and state officials. The premier referred to politicians who said they would stage rallies and violence against the government to stop reconciliation, and would create violence like that seen in the South. Once again, the ousted regime of Yingluck Shinawatra, along with her deposed brother Thaksin Shinawatra, has promised and now carried through with acts of terrorism and violence aimed at destabilizing, dividing, and destroying the nation. Thaksin Shinawatra, a convicted criminal living abroad to evade a two-year jail sentence for corruption and a long list of pending court cases has for the past decade led brutal campaigns of mass murder, terrorism, and targeted assassinations against his opponents and the people of Thailand, all with enthusiastic Western backing. A brazen broad-daylight assassination of NGO worker, activist, and protest leader Sutin Taratin during the February 2014 general elections. A grisly attack in the eastern province of Trat carried out by Shinawatra's militants that left scores maimed and a five-year old girl dead with a similar attack carried out in Bangkok the same day that left many maimed along with a woman and two children killed. Multiple M79 grenade attacks carried out on the office of the National Anti-Corruption Commission in northern Bangkok in conjunction with a blockade carried out by the regime's "red shirts." The blockade was aimed at obstructing criminal proceeding against then prime minister, Yingluck Shinawatra. 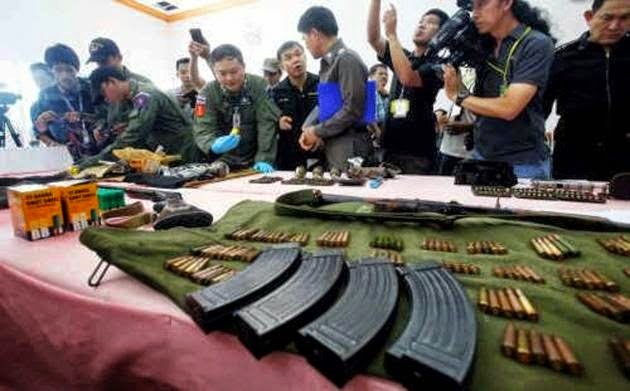 Regime supporters would be arrested for possession of AK47s, M79 grenade launchers, and RGD-5 hand grenades, the latter two with lot numbers matching those used in previous attacks across the city. The accidental discovery made by police of a white Mazda parked outside the resort of regime MP Sitthichai Kittithanesuan, containing AK47s in the backseat. The car was owned by an "adviser" to a regime minister. In total, nearly 30 would die and over 800 wounded. In essence, Shinawatra and his movement openly declared they would resort to terrorism, prepared for it, then carried it out, and have now, once again attempted to maim and murder innocent people in order to seize back power. In Thai culture, each day of the week has its own color associated with it. Because Sunday is associated with red, Shinawatra's supporters known as "red shirts" have chosen it as a day of activism. One of Shinwatra's political enforcers, Sombat Boonngam-anong, literally leads a faction calling themselves the "Red Sunday" group. The timing of the double bombing on Sunday is meant to send a message to the current Thai government now in the process of finally and permanently uprooting Shinawatra and his political machine from Thailand's political landscape, that there will be no peace or stability if further impunity is not granted. 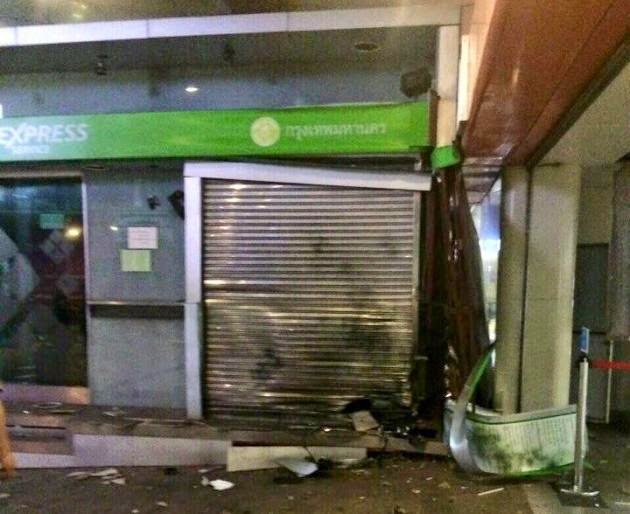 Despite just days ago Shinawatra's own political enforcers vowing to carry out acts of terrorism and specifically a bombing, Western pundits and defenders of Shinawatra's political network are claiming Shinawatra had nothing to gain by carrying out such violence. Omitted are the thousands of people put to death under his regime during his time in power. Indeed, in 2003 he had 3,000 people extrajudicially murdered in the streets over the course of just 90 days in what he called a "War on Drugs." It was later revealed that over half of those mass murdered had no connection whatsoever to the drug trade. Despite even Thailand's Constitutional Monarchy calling for an investigation into the deaths, Shinawatra's impunity was already such that no investigation or legal proceedings were brought against him. The following year, Shinawatra would order protests in Thailand's troubled south be put down, seeing 85 mass murdered in a single day. Also during Shinawatra's time in office, according to Amnesty International, 18 human rights defenders were either assassinated or disappeared during his first term in office. 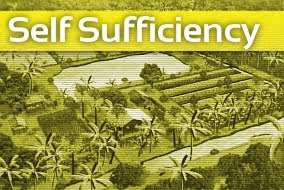 Among them was human rights activist and lawyer Somchai Neelapaijit. He was last seen in 2004 being arrested by police and never seen or heard from again. Ousted in a military coup in 2006, Shinawatra would continue to conduct a campaign of terror and murder against his opponents. In April of 2009 gunmen would fire over 100 rounds into the vehicle of anti-Shinawatra activist, protest leader, and media mogul Sondhi Limthongkul in a broad daylight assassination attempt. He was injured but survived. Also in 2009, Shinawatra would call for riots in Bangkok where his supporters gunned down two shopkeepers amid widespread looting and vandalism. Images: Thaksin Shinawatra deployed some 300 heavily armed terrorists in Bangkok in 2010 triggering bloodshed that would claim nearly 100 lives and leave the city in flames after a final day of serial arson was carried out by his political supporters. On April 10, 2010, heavily armed professional militants deployed by Thaksin Shianwatra and his "red shirt" front targeted and assassinated Colonel Romklao Thuwatham who was at the time commanding crowd control operations near Bangkok's Democracy Monument. 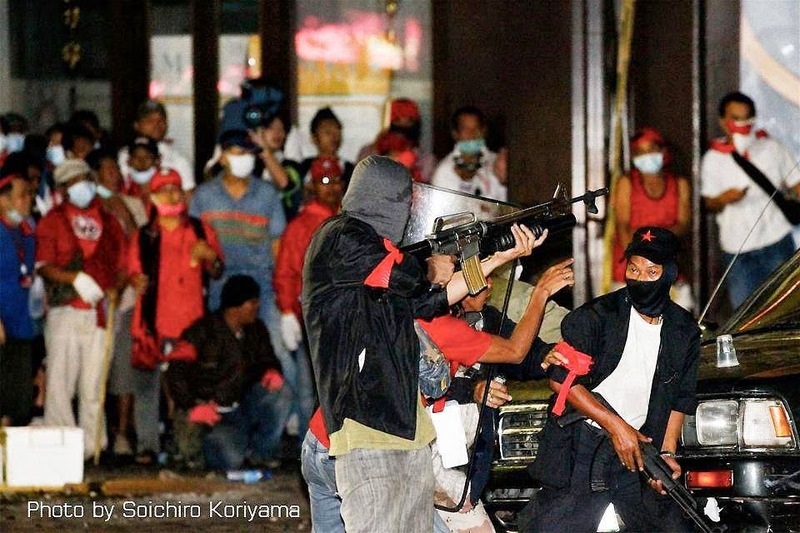 Thaksin's "red shirts" would go on to clash with the military for weeks before ending their riot with mass city-wide looting and arson. Nearly 100 would die in the bloodshed, during which "red" publications eagerly called on its followers to come to the city and join in armed insurrection. Another high-profile assassination would take place in August of 2013, when businessman and outspoken Thaksin opponent Ekkayuth Anchanbutr was abducted and murdered. 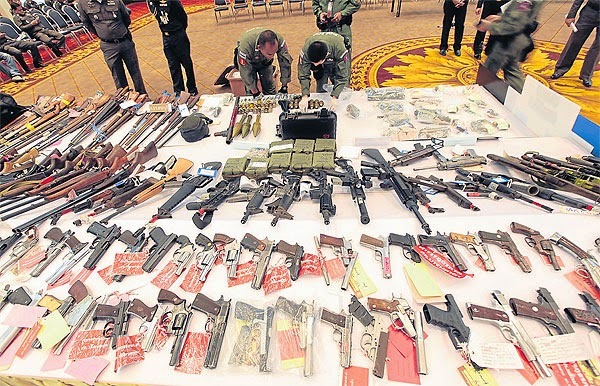 Image: A weapons catch seized by the Thai army from Shinawatra's armed networks in the wake of the 2014 coup. Clearly, the recent bombing is but the uninterrupted continuation of Shinawatra's decade of mass slaughter in his bid to eliminate his opponents and silence any and all opposition while consolidating and exercising absolute control of the nation.